Tag line: "Germany was arming itself for war. But they didn't count on one man"
Winston Churchill was the Prime Minister of the UK during World War II, a very difficult time in the nation's history. With the Nazis setting up shop just across the channel in France, the threat of invasion loomed heavy over the British Isles, yet through it all, Churchill remained steadfast in his belief that the Allies would be victorious in the end, that Hitler’s Germany would be defeated, and the world would once again be safe from tyranny. The 2002 movie The Gathering Storm, jointly financed by the BBC and HBO, is set several years before the war breaks out, when Churchill, viewed as a Tory relic by both the opposition and members of his own party, went to great lengths to warn Britain that Adolf Hitler and Nazi Germany could not be trusted. Alas, very few people agreed with him, calling the elder statesman a war monger and doing what they could to silence him. In the 1940s, Winston Churchill was a beacon of hope for millions of people who’d gather by their radio on a regular basis to hear his words of encouragement. As The Gathering Storm shows us, in those years before Europe erupted, hardly anyone was listening to him at all. By the 1930s, Winston Churchill (Albert Finney), having served in Parliament for several decades, was out of a job. But much to the government’s chagrin, that wasn’t enough to keep him quiet. Believing that Prime Minister Stanley Baldwin (Derek Jacobi) and his cabinet were bending over backwards to appease Nazi Germany, Churchill regularly spoke out against the administration, warning England that, like it or not, war was on the horizon. Only a select few shared his beliefs, including Ralph Wigram (Linus Roache) of the foreign office, who supplied Churchill with information about the Nazis; and good friend Desmond Morton (Jim Broadbent), a former military man who, in later years, would serve as Churchill’s personal assistant. Yet try as he might to convince his fellow countrymen that Germany was a force to be reckoned with, his words often fell on deaf ears. During this same decade, Churchill’s private life was every bit as tumultuous as his public one. Having retreated to his country home in Chartwell to finish writing a book about his ancestor, the Duke of Marlborough, Churchill argues frequently with his wife Clementine (aka “Clemmie”) about their troubled finances (Churchill lost quite a bit of money when the U.S. stock market crashed in 1929). Though the couple was still very much in love, Clemmie, in need of some alone time, also went on an extended overseas holiday, leaving Churchill to wonder if she was ever coming back. It proved to be a dark period in Churchill’s life, but an even darker one was fast approaching, when Britain would once again look to him for guidance. As always, Winston Churchill answered the call, and the rest, as they say, is history. Over the years, I’ve seen several actors portray Winston Churchill, including Bob Hoskins (in the ‘90s TV miniseries World War II: When Lions Roared) and, more recently, Rod Taylor, who briefly appeared as the former British Prime Minister in Quentin Tarantino’s exceptional 2010 war flick, Inglourious Basterds. In an interview Taylor gave around the time that film was made, he said he was thrilled to have worked on the movie, but added that, when he was initially contacted about the role, he asked Tarantino why he didn’t offer the part to Albert Finney instead. To know why Taylor posed such a question in the first place, one need look no further than The Gathering Storm. Finney’s performance is more than a simple impersonation; he somehow manages to embody the former leader, capturing not only his power as a statesman (i.e. - his knack for public speaking), but also his private persona, including his cantankerous nature (he’d often snap orders at his butler, Inches, played here by Ronnie Barker) as well as the love he had for his wife, and how helpless he felt without her (during Clemmie’s trip overseas, he’d check the mail every day for a letter from her, and wallow in self-pity if one didn’t arrive). More than anything, though, we see how proud he was to call himself an Englishman (as evidenced in the brilliant scene where he explains to Clemmie why he bought the house in Chartwell), and how frightened he was for the country’s future, fearing they weren’t prepared for the hell that Germany was about to unleash on the world, then doing everything in his power to ensure they were. 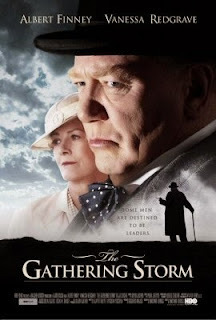 The Gathering Storm is a superb film in many regards, perfectly recreating the period in which its set and featuring an excellent supporting cast (Derek Jacobi shines as the PM who’s often the target of Churchill’s verbal attacks, while Redgrave delivers a heartfelt performance as the devoted wife who’s not afraid to stand up to her husband). Leading the pack, though, is Albert Finney, winner of a Golden Globe, a BAFTA, and a number of other awards for his spot-on portrayal of a giant of a man who, more often than not, was just as human as the rest of us.